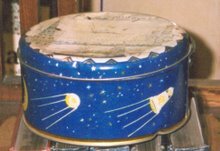 Who was the first Australian in space? Andy Thomas? Paul Scully-Power? I hear you say. Well, no. The first Australian in space was a young boy called Neville in the early 20th century. What? How was that possible before the WWII rockets? Will you tell us the story? Actually, it's not my story. Famous Australian writer C.J. Dennis first set down the events in The boy who rode into the sunset. Sometime before 1921, Neville lived with his family on the outskirts of an unnamed Australian city. One evening he was standing on top of a hill watching the clouds, when one formed into a horse and approached him. The horse (rather manipulatively) enticed him to mount it, and then took flight, riding straight into the sunset. The sunset is not what it seems. It's an orchestrated performance that has to continually move around the world with the terminator (the dividing line between night and day). As Neville arrives, the Last Sunbeam is getting ready to move the sunset to the next location. His boss, the head scene-shifter, isn't very pleased to see Neville, but there's a problem: how can they get him home again? The cloud horse can only follow the sunset; it can't go backwards. The only solution is for him to go round the Earth ahead of the sunset. Nev is justifiably a little nervous about this proposal, but the Last Sunbeam has it all sorted. He gives him a blue flower - made out of a 'genuine piece of sky' - which he has to give to the Porter of Dawn on the other side of the world in order to be let through. The Sky Flower will also defy gravity to allow him to jump off the cloud horse when they reach Neville's home again. The cloud horse, from this point on, loses its agency and effectively becomes a satellite. Almost before he knew what had happened, he had left evening far behind and was riding in broad daylight. The cloud Horse had ridden high in the air, and Neville saw the broad country, with plains and hills and forest lands, stretched far beneath him. An instant later, and the land was no longer below him, but the wide sea, sparkling in brilliant sunlight. Before he had time to notice very much he had reached mid-day, high over a strange foreign land, and was racing through the morning toward the dawn. So quickly did he go that there was little chance of seeing anything clearly; but he had glimpses of many strange sights. Many ships he saw upon the sea - small ships and stately steamers crawling over the ocean like strange water-beetles. Once, as the Cloud Horse drifted low, Neville saw a beautiful sailing-ship, with all sails set, and strange-looking men upon the deck. They looked very like pirates, and perhaps they were; but Neville had no time to make sure, for the very next minute he was over a wild land where he saw a horde of black men, with spears and clubs, hunting an elephant through a clearing in a great jungle. As he looked, the elephant turned to charge the hunters; but what happened then Neville did not see, for in a moment more he was above a great city with crowds of people in the streets - people dressed in strange, bright-coloured clothes - and there were bells ringing and whistles blowing. Then a great desert spread beneath him, with no living thing in sight but a great tawny lion prowling over the sand. Then came the sea again, and more ships; and the light began to grow dim, for he was nearly half-way round the earth, and was approaching the dawn. He arrives at the silver gateway of the dawn. The Dawn Porter sees the Sky Flower and lets him through. ...in an instant Neville had passed through the dawn and plunged into the night. It was a dark night, with no moon, for the sky was overcast with dense clouds. Above these the Cloud horse flew, and overhead Neville saw the rushing stars, and below only the blackness of heavy clouds. But more often the Cloud horse flew low, and then there was little to be seen. By the lights of moving ships Neville knew that sometimes he was above the sea. Sometimes twinkling lights in towns or solitary farms, or the sudden blaze of a great city told him that the land was beneath him. Once, through the blackness, he saw a great forest fire upon an island, and the light of it lit up the sea, and showed the natives crowded upon the beach and in the shallows, and some making off in canoes. Then darkness swallowed the Cloud Horse again, and the blazing island was left far behind. After that, Neville began to feel a little drowsy. Perhaps he did sleep a little, for the next thing he saw was a faint light in the sky before him, as though the dawn were coming. But he knew it must be the evening, because he was coming back to the place from which he had started, and was catching up with the sun. You see, he had only been gone a few minutes. The Cloud Horse flew very low now; and rapidly the darkness grew less. Then, long before he expected it, Neville saw the roof of his own home below him. He could see the garden in the twilight and his own dog sniffing about among the trees as though in search of him. Using the Sky Flower, Neville jumps from the horse and arrives safely home in time for dinner. He gives the Sky Flower to his mother, and as it's a genuine piece of sky, it never fades. To get around the world in a few minutes, the cloud horse is clearly very high and very fast (in fact it takes 90 minutes in Low Earth Orbit at about 200 km). 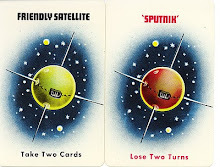 When Yuri Gagarin made his orbit in 1962, there was great interest in what he could see. 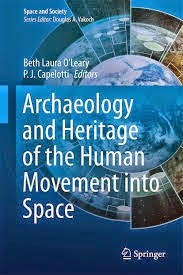 To be visible from space - or reputed to be - is a measure of cultural significance. Neville clung on tightly, for he was so high above the earth that to fall off would mean the end of him. And far beneath him he saw the green fields and the white road, which now seemed like a mere thread. It's a tame land, not a wild land. As you know, I'm very interested in how people imagine experiences of being in space. (As in here and here). I do think this is a rather lovely description of what it might be like to be in orbit. Neville and the cloud horse are not described as being in space, and much of what he sees you wouldn't even be able to discern from an aeroplane, let alone a satellite. Remember in this era very little was known of the upper atmosphere; and we have enough trouble defining where space begins today. Dennis is thinking specifically of aerial views ('Of course, now that aeroplanes have been invented, flying is not thought so wonderful as once it was'), but Neville's speed is in contradiction to this. And he clearly does make a complete orbit! C.J. 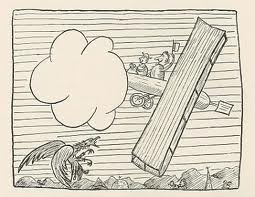 Dennis' charming illustration of a biplane. Gosh, those two are having fun! The Sky Flower is an interesting touch. It's a talisman, as the Last Sunbeam explains to Neville (I found that such a fascinating word as a child. I had to ask my mother what it meant). A little later (1927-1928), Hugh Lofting also used flowers in space - when Dr Dolittle flies to the moon on the giant microgravity moth Jamaro Bumblelily, oxygen-storing flowers are used as breathing devices. So that's the story of the first Australian in space. Think of it next time you stand gazing into the sunset! When I was researching my submission of 'Namatjira' for the name of a crater on Mercury (see this post), I had to go through the list of existing names. Features on the heavily-cratered planet are named after artists of all genres, but they have to be significant in some way and dead for a seemly amount of time. I was very pleased to see that one of my all-time favourite writers, the 10th century Japanese courtier Sei Shonagon, had been craterised. I first came across her famous Pillow Book in a second-hand bookshop when I was a teenager. I suppose I thought it might be some sort of saucy romance. I soon found out the error of my assumptions, but it has been one of my favourites ever since, a book I can read over and over without tiring of its pleasures. (I should mention that I'm old school about this and I like the Ivan Morris translation best). Sei Shonagon was very erudite in an era when women weren't supposed to be. 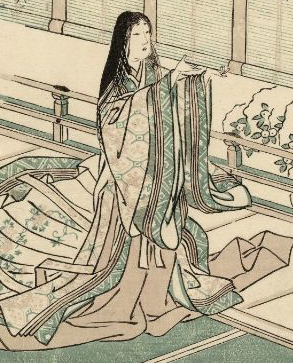 Only men were allowed to know Chinese, but Sei Shonagon managed to teach herself, and every now and then would astonish the male courtiers by some oblique reference to Chinese poetry. She had to be careful about it though, or risk being seen as unfeminine in a blue stocking kind of way. She had a slightly wry, acerbic personality, and is sometimes a bit vain and shallow. One of the most appealing things about her is just how human she comes across as, over a thousand years ago and through translation from Japanese. It's a fascinating insight into another world, the Heian court of the 10th century, and it's worth looking up the notes as you're reading it to find out what everything means. The most outstanding thing about her writing is the fine sense of observation. Colours, textures, nuances, little everyday incidents, are rendered profound by her framing of them. She writes lists of things that show the listicles of today's online press how things are really done. Reading her lists and her observations gives you a new appreciation of the world. Indeed, one's attachment to a man depends largely on the elegance of his leave-taking. A lesson for my teenage self indeed. The Mercury-orbiting Messenger spacecraft, a collaboration between NASA, the Carnegie Institute for Science, and the John Hopkins Applied Physics Laboratory, is celebrating its tenth anniversary. As part of the celebrations, they're having a competition to name a crater (it closes on 15 January 2015). It's a celebration but it's also a swan song. Somewhere around March this year, the plucky little spacecraft will run out of fuel and end up as a smear on the planet's surface. According to the IAU rules for Mercury, impact craters are named in honor of people who have made outstanding or fundamental contributions to the Arts and Humanities (visual artists, writers, poets, dancers, architects, musicians, composers and so on). The person must have been recognized as an art-historically significant figure for more than 50 years and must have been dead for at least three years. We are particularly interested in submissions that honor people from nations and cultural groups that are under-represented amongst the currently-named craters. See the current list of named Mercury craters. I was lying in bed one Saturday morning, lazily turning various thoughts over in my mind, when inspiration struck. 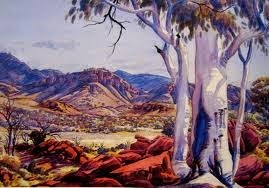 I should propose the Aboriginal artist Albert Namatjira. I thought Namatjira would be a good name for Crater C, which has yellow-orange volcanic deposits, not unlike the colours of central Australia in the scenes that became Namatjira's most iconic. And Aboriginal people are definitely an under-represented group in the names not just on Mercury, but in the rest of the solar system. 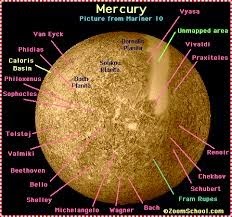 On looking up the list of existing names, I discovered that there are two Australians already on Mercury (so to speak). They are Clarice Marjoribanks Beckett, a painter, and James "Frank" Hurley, a photographer, and both fascinating people in their own right as you can see if you follow the links. One criterion was met already: only two Australians in a gazetteer of 372 names, and neither of them Aboriginal. "Namatjira's paintings express his relationship with the Arrernte country, particularly the Western Arrernte lands, for which he was a traditional custodian. Through his intense scrutiny of specific places and his sensitive response to their individual qualities, Namatjira enables us to see the Centre as a multi-faceted region of Australia. A region of extremes, central Australia is far from a 'dead heart'”. These words could equally be applied to Mercury: the eye of the artist allows us to see beyond the superficial to the complexity within. For more details, see his entry in the Australian Dictionary of Biography, which was a major source for the above. My opinion is that this is an absolute winning proposal, and I really hope the committee thinks so too. It's interesting, though. The rules of naming are very clear: the name should not have any 'political, religious or military significance'. That's fine as it stands. And Albert Namatjira wasn't a general, or used as a rallying point for radical Aboriginal resistance, or the centre of a cult. Events on Earth won't be upset by having a crater named for him. But he was an Aboriginal man who lived through a period where Aboriginal people were treated like livestock, and were assumed to be on the verge of extinction. He grew up on a mission, one of the aims of which was to Christianise Aboriginal people and destroy their culture. (You'll notice my subtle attempt to describe these complex issues in the submission). He was treated as if he had given away his Aboriginality by working in a contemporary modernist tradition; yet if he had painted in a 'traditional' way, he would have been constructed as 'primitive'. You can read about how Australia's policies about Aboriginal people affected his life in the Australian Dictionary of Biography entry. The International Astronomical Union, which administers the naming of planetary features in the solar system, is definitely right to be targeting groups who are marginalised or overlooked. But there is a sense in which just being Indigenous in the modern world is already political. You can't be neutral as an Indigenous person in a colonial society. 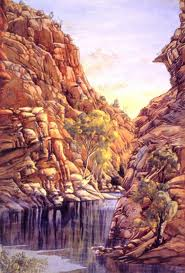 The very act of becoming outstanding in some way only serves to bring into sharp focus the inequalities that exist, and Namatjira's life illustrates that. I hope I've walked the fine line of acknowledging the appalling treatment of Aboriginal people in White Australia while representing Namatjira for what he was: a brilliant artist with a unique vision who deserves to immortalised on Mercury. Keep your eyes out for the results of the competition in late March/early April! Recently I found a old notebook from 2003. 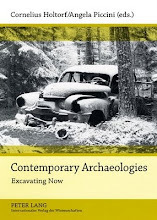 It contains various lists of things I need to do, notes for a paper I was writing at the time on the English collector and armchair anthropologist Henry Ling Roth, my photograph catalogue from a visit to the Woomera rocket range, and lots of scribbled ideas and thoughts. X ray image of Alan Bean's space suit from the Skylab 3 mission, from the US National Air and Space Museum's exhibition Suited for Space. You can probably see the directions I was going in by reading between the lines of these sparse dot points. This wasn't so long after I finished my PhD, which was about body modification, so theories of embodiment were still very present in my mind. All the same, I think there are still some interesting things to be explored in a few of these elements, particularly gravity, anthropometry, and boundaries. Ransom, by the way, is C.S. Lewis' reluctant astronaut in Out of the Silent Planet and Voyage to Venus (also known as Perelandra. I pretend That Hideous Strength doesn't exist). I often find myself using Lewis' words as windows into space, as his vision was so unique and prescient. Like many an archaeologist, as a child my fascination with the past went hand-in-hand with a fierce desire for the other worlds of the future. And like so many others of my generation and before, the fiction of Isaac Asimov was massively influential. In his sparse prose and sardonic humour, he opened up realms of philosophy that extended from the surface of the Earth to the furthest reaches of space and time. My favourites included short stories Nightfall (1941), The Last Question (1956), and The Dead Past (1956), and novels The Stars Like Dust (1952), the Lucky Starr series and the original Foundation trilogy. I read them over and over again (and still do, to be honest). (And just quietly, Jonathan Nolan, writer of Interstellar, may be going to make a film of Foundation ....). Some of them stand the test of time better than others, and I guess that is why they stay favourites. 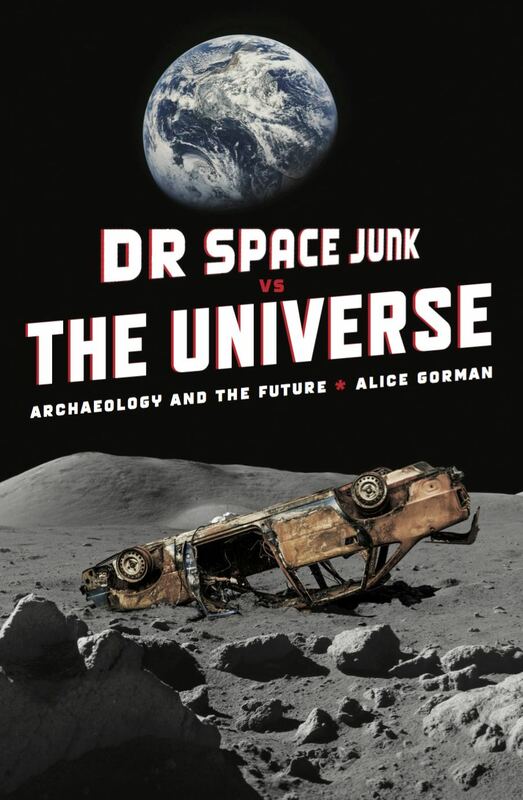 The Lucky Starr young adult series is still a very entertaining read, and there are some aspects of it that I've often found in the back of my mind when writing about space archaeology. My two favourites are The Oceans of Venus (1954) and The Rings of Saturn (1958). Lucky Starr and life in the solar system. Venus was a mystery until the 1960s. With an impenetrable sheath of clouds and limited data, no-one knew what surface conditions on Venus might be and there was much room for speculation. Was Venus a dry desert planet, awash in oceans of carbonic acid, studded with pools of molten metal, or lush and swampy, a bit like Palaeozoic Earth (from 542 to 251m years ago)? Asimov's Venus is an ocean world inhabited by telepathic frog-like creatures. Over the surface of the ocean grows a crust of seaweed that forms the main resource of the human colonies, living in domes on the ocean floor. Lucky and his sidekick Bigman find out that the V-frogs have been manipulating the human inhabitants to protect their own interests, and needless to say, they foil the plot. The V-frogs are rare examples of Asimovian aliens; he stopped writing about them in the 1960s. 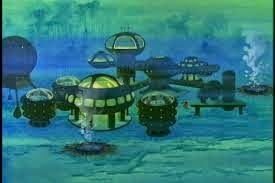 This is actually Sealab 2021 ... but you get the idea. Nowadays it's all about floating cities. The enticing vision of a Venus teeming with life was dented by NASA's Mariner flyby mission in 1962, and destroyed by data from the USSR's Venera missions from the 1960s onwards. Sadly, Venus had surface temperatures of around 430 C and pressure over a ninety times that of Earth, and not an ocean in sight. So no Venusian frogs for us. But I still love this novel for the suspenseful plot, and for the sense it gives of just how quickly our knowledge of the solar system expanded from the launch of Sputnik 1 in 1957. For later editions, Asimov had to write a preface explaining why his Venus was so different to that revealed by the orbiters and landers. It makes me long, though, to have experienced the days before I was born when Earthlings could dream of wonders in the rest of the solar system, before we found out that we were effectively alone. The Rings of Saturn is interesting for a completely different reason: the underlying theme is who owns space, and the justification for territorial claims. This is a theme particularly relevant in the present, when we may see a radical revisioning of our current treaties and agreements about the exploitation of resources in the solar system. 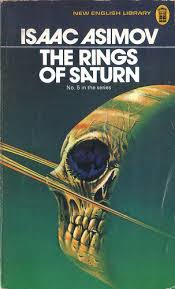 In the Rings of Saturn, the evil Sirians from the Sirius system build a secret colony on the Saturnian moon Titan. (One of the reasons they're evil, incidentally, is because they practice eugenics. On the upside, their robots are accorded rights. Lucky is told that roboticide is considered almost as serious a crime as homicide). It has been an unwritten principle that a solar system is the territory of the first colonisers or original inhabitants, whether or not they have a presence on all bodies within it, or make use of any of the resources. Lucky Starr discovers the Sirian's plans and an interplanetary crisis ensues. The Sirians declare that 'An empty world is an empty world, regardless of the particular route it travels through space. We colonized it first and it is ours'. Earth had not paid any attention to the Saturn system, so it was 'use it or lose it'. However, the wily Lucky had previously planted an associate on one of Saturn's other moons, Mimas. When the Sirians remove him as a spy, Lucky argues, at an interplanetary conference before the representatives of the Outer Worlds, that the Sirians have revealed the hypocrisy of their intentions, as they were not prepared to harbour another sovereign colony within the same system. What I find really interesting is the development of a gravitation-based principle of space tenure, if you like. The objects orbiting a more massive object are held to be part of the same entity, whether on planetary scale or solar system scale. This entity then assumes a customary law status. At present space, and the celestial bodies of the solar system, are considered to be the common heritage of humanity and a global commons. According to existing treaties and conventions, which came into being after Asimov had written The Rings of Saturn, no-one can make a territorial claim on space and the resources of space are meant to be equitably distributed among the inhabitants of Earth. How exactly this might happen is not clear, and there are many who regard this principle as a major impediment to state-based or private organisations seeking to develop resources in space. At some point 'use it or lose it' might be back on the table. With humanity flying about among the planets and even among the stars, science has become of constantly increasing importance, for solving both internal problems of health and energy and external problems of scientific and alien threats to Earth. So the Council of Science has become a major political force on Earth, and Starr is its best roving investigator (Gunn 1996:144-145). The subtext is that scientists are not swayed by politics and emotions in the same way as politicians, and hence can be trusted to enforce goodness and niceness across the solar system (even if this means resorting to subterfuge from time to time). Indeed, Lucky has been referred to as a 'two-fisted philosopher king' (Weinkauf 1979-1980:130). The philosopher king is a concept from Plato's Republic: the person best suited to leadership is a philosopher who really doesn't want to do it, and has to be compelled. Because the philosopher cares nothing for personal gain, they will govern with fairness. With the current anti-science sentiment of governments in Australia, Canada and elsewhere, I've been reflecting on the importance Asimov gives to role of science in governance. We do actually have the International Council of Science, which represents all the international scientific unions, but it's not really political in the way that Asimov's Council is. Space is no place for a girl - OR IS IT? Let's not forget that Asimov was not writing Lucky Starr adventures for me and other girls like me. John H. Jenkins, in his fascinating account of the Lucky Starr novels, notes that they were aimed towards 12-year old boys. 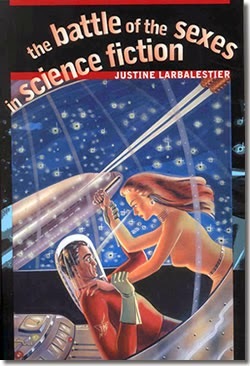 Justine Larbalestier has documented a letter exchange in the pages of Astounding Stories magazine that demonstrates Asimov's opinion of the role of women in science fiction. While all very tongue-in-cheek, the exchange demonstrates some deeper issues about how women were portrayed in the genre and women as readers. we could have women-scientists. Madame Curie is immortal, so are many others. Unfortunately, instead of having a properly aged, resourceful, and scientific woman as a savant, what do we have? When there is a woman-scientist (which is very rare in fiction, believe me) she is about eighteen and very beautiful and, oh, so helpless in the face of danger (gr-r-r-r). Another reader, Mary Evelyn Rogers, responded that the solution should be to write more realistic women into science fiction rather than doing away with them altogether. The young Asimov, however, couldn't quite untangle women from romance - he called for better written love interests, rather that giving women a role as scientists. there are two females here, a clinging vine and a cat (1979-1980:130). Blissfully unaware of such gender politics as a pre-teen, I WAS Lucky Starr. I was the resourceful, scientific, two-fisted philosopher king, outwitting the thugs in space battle through my knowledge of Newtonian mechanics. It was only later that I realised my choices were rather the clinging vine or cat. By then it was too late. I was set on the path to science. I might even be considered, now, to be "properly aged". Happy birthday, Isaac Asimov - long may you continue to inspire!